Sometimes my experimenting in the kitchen pays off, sometimes…not quite so much. Take it from me, mashed wasabi potatoes with purple carrots doesn’t work. It should have, but it didn’t. It really, really didn’t work. The Monkeys refused to go near it, purple wasn’t for them. Mr Chocolate bravely tried to plod through it until I told it was ok, he really didn’t have to be so brave. I also gave up after the multiple sips of water in between, just trying to get the sucker down. Lucky for me (and lucky for everyone else involved) these scrolls I have also been experimenting with lately didn’t have the same effect as the purple wasabi playdough. Add starter, yeast and water- together. Whisk and leave for an hour or so. Mix remaining ingredients together and then knead for 5 minutes on a lightly floured surface or until well incorporated and dough is smooth. Leave to prove for a couple of hours. Roll out to a rectangle. Spoon pesto on, grate some parmesan. Roll up dough, slice into portions. Place on a lined tray, allow to prove for another hour or so. Bake at 190 for 20-25 minutes. 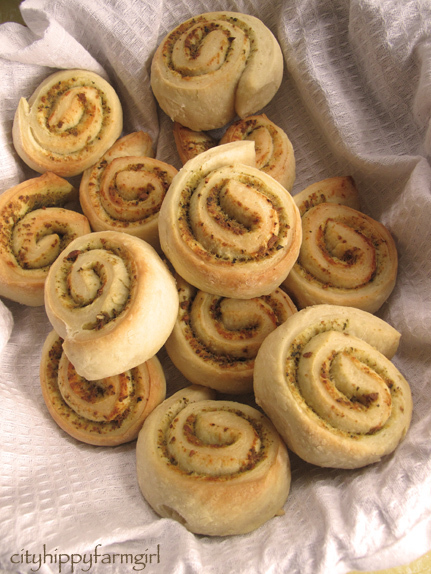 This entry was posted in Baking Bread and tagged bread, easy, parmesan, pesto, picnic, scrolls, sourdough by cityhippyfarmgirl. Bookmark the permalink. These look great…every now and then I convince myself the family is bored with my cooking and try something sure to fail, last week it was a chicken and sausage jambalaya. Looked so mushy and awful the kids just dug their heels in and wouldn’t give it a go…all that effort! Hope mr chocolate had another special birthday treat. He did. Thankfully there was other stuff to divert the attention away from the purple gloop. Ha, Katherine had a doozy of a dish lately. By doozy, I mean doozy of a bad one! These rolls look good. oh do tell! I can’t imagine you guys ever having a bad one. No, no the purple carrots rest assured are delicious and I really love them. It was just the combination of everything else I had put in there was….hideous. Oh the humble scroll……you can pack anything into these babies and pretty much get away with it. We love them here too, especially for the lunch box……yours look so yum! Packed into the lunch box today. Easy! I made this – but rather than scrolls- made a filled bread. Everyone loved it- but I think they would have enjoyed the scrolls even more. It is a brave women who admits to her awful meals/experiments. Had to admit to it Heidi as realistically it’s been etched into our minds for ever more… oh! Thanks CL… go forth and scroll! I love pesto and Parmesan, so how could these fail?? you’re right. I think the dodgy times keep you on your toes a bit, and reminds me not to get lazy. Self recipes can sometimes have that ‘mystery’ result! It’s great to have that creative flair! These scrolls look delicious! Due to never following a recipe… there is quite a bit of mystery round these parts. Oh dear, i had to have a little giggle at the playdough dinner. They scrolls look amazing though. Yummy! 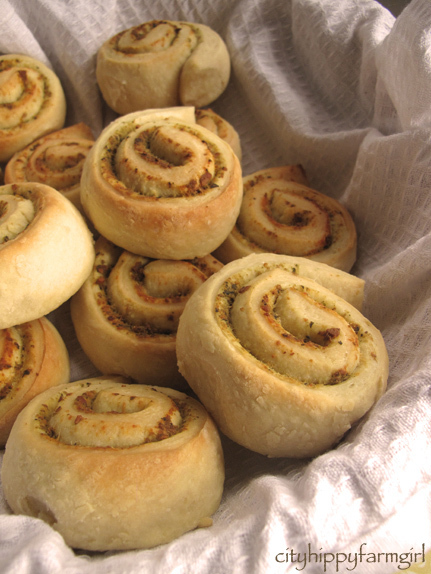 Thiee scrolls look delish. believe me I’ve had many a kitchen disaster…I imagine, way more than you ; ) Will definitely be trying these. Thanks! You would have thought I would have picked something tried and true for his birthday…ahh, but no. I like to keep everyone on their toes. Teehee! Thanks for the giggle. I take my hat off to you, mother with newborn who can keep a sourdough starter alive and frothing while over here, it lasts a few bakes until it is sadly nudged towards the back of the fridge..*again*.. only to repeat the whole process again. sigh. I do have to keep the starter at the front otherwise it gets pushed aside. Chocolate could easily take precedence…oh oops! we have so much happy basil in our garden but alas our blender has just started to make strange noises, smell very bad, and smoke just a little bit too much. so until i get a replacement we’re having ‘deconstructed pesto’. Oh can I swap you a working blender for some happy basil? I can never grow basil, or if I do the slugs find it slugalicious. See visually, purple gnocchi would be awesome! Which was the effect I was trying to go for with the mashed potato…alas it wasn’t to be. Phew! I was dismayed when I saw your photos.. I thought, “No.. don’t let it be these that don’t taste good… they’re so beautiful” Lol.. glad to hear they were a smashing success.. unlike your purple carrots!! Purple carrots should be left to eat and enjoy by themselves! Kim…that is hilarious!! 🙂 🙂 love it. For some reason I’ve always been a little scared of baking scrolls. They looks so simple and easy, but I can imagine having a pile of ugly shapes on my hands. These rolls look fabulous! You really MUST publish a cookbook! I know loads of people who would buy it! oh wow those scrolls look fabulous! As for the disasters…my kitchen plays host to many of those, particularly in the bread department!